We wanted to give Andrew a spectacular bar, so he could serve his favourite tipple of cider and enjoy time with his friends without the need to go too far. Malvern Timber Framed Buildings absolutely came up trumps with their brilliant bar and shed combination. The bar area comes complete with matching bar and the shed is perfect for storing kegs of cider and your bar supplies! 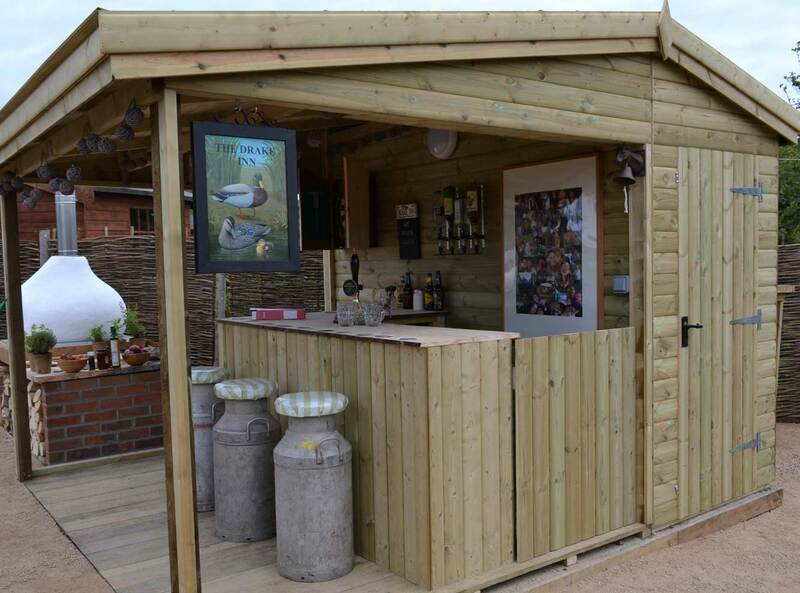 The built in floor and timber roof really gives this garden bar a rustic look, perfect for the countryside setting. The wonderful thing about Malvern Garden Buildings is that they can customise any garden building to suit your space and style. There is a choice of windows, roofing, finish to timber…you can even design your own and they will build it! All the timber used in the construction of their buildings originates from sustainable forests and is treated. Andrew and Rachel’s existing fencing had all but fallen down, so we needed to find something suitable to replace it with. 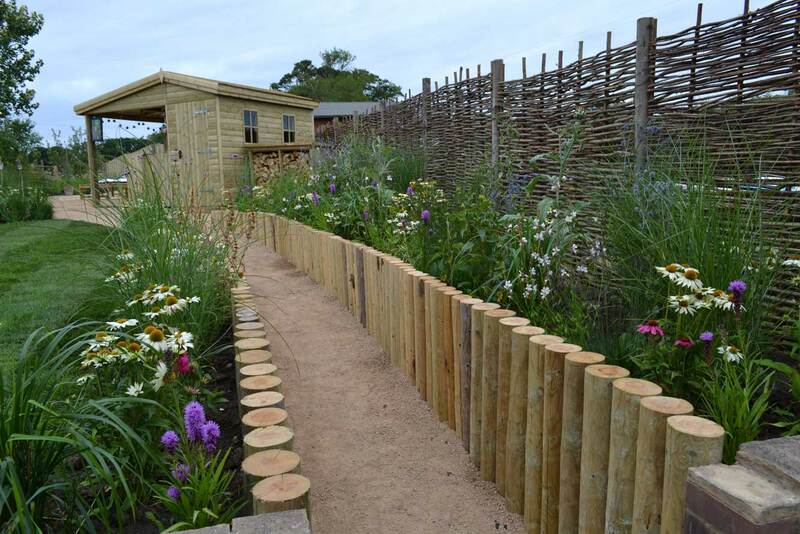 We wanted a natural looking fence which would fit in with the surroundings and Primrose’s Hazel Hurdle fencing is perfect for their garden. Skilfully handwoven in hazel from sustainable sources, these fence panels are perfect for either a country garden or a natural look for 21st century urban spaces. Versatile design will make for an attractive screen or fence for the garden. Hazel fencing is coppiced, meaning the branches are cut only from new growth. The purpose is two-fold: to ensure that the branches or ‘wands’ are flexible and of reasonably uniform thickness, and to allow more growth for next year. Hazel Hurdles can be cut easily to reduce the height of them by cutting the verticals and removing unrequired horizontals. The width can be reduced by carefully cutting to ensure that the horizontals don’t become unwoven. 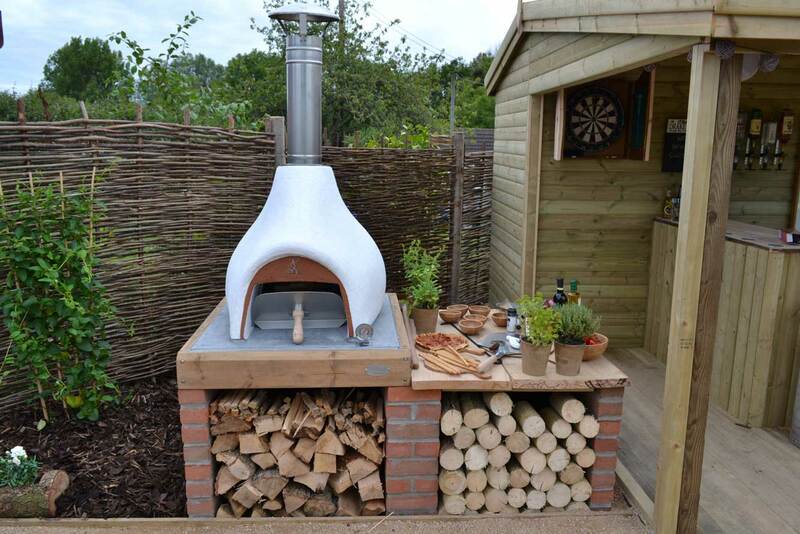 We wanted to give Andrew and Rachel a wood fired oven for them to cook up delicious food in their garden. Andrew is a keen baker, so the Small Onion shaped Bushman Wood Fired Oven was a perfect choice, because he can bake cakes or cook pizza and even roast or braise meat in it – a really versatile family size oven. We also chose the Bushman Wood Fired Oven from Dingley Dell Enterprises because it’s hand made in England and because of its fabulous shape. Like its name suggests – it resembles the shape of an onion! We built a low brick base for it to sit on so that Andrew can cook on it from a seat to save him having to stand up all of the time. We also built a matching work surface, so that he can prep the food going into the oven. Another wonderful benefit of using this oven is that unlike most BBQ’s and ovens, it can be used in areas where there are smoke control acts in place. In fact this is the first British built wood fired oven to meet the strict smoke control regulations. The oven was assembled quickly and easily on site and Andrew and his family have been busy cooking on it ever since! We wanted a surface for the newly created, long winding path in Rachel and Andrew’s garden that was attractive, low maintenance and quick to install. Breedon Golden Amber gravel was the obvious choice – it’s the most prestigious self binding solution for perfect pathways and driveways and the only self binding gravel to hold The Royal Warrant! It is easy to install and form a solid surface because it is self binding – this also makes it low maintenance – perfect for Andrew and Rachel. Breedon Golden Amber gravel is a natural limestone graded 12mm to fines, quarried exclusively at Breedon on the Hill in Derbyshire. It has robust performance with a soft natural golden finish making it the ultimate pathway choice. It is supplied in quantities from 1 tonne upwards. 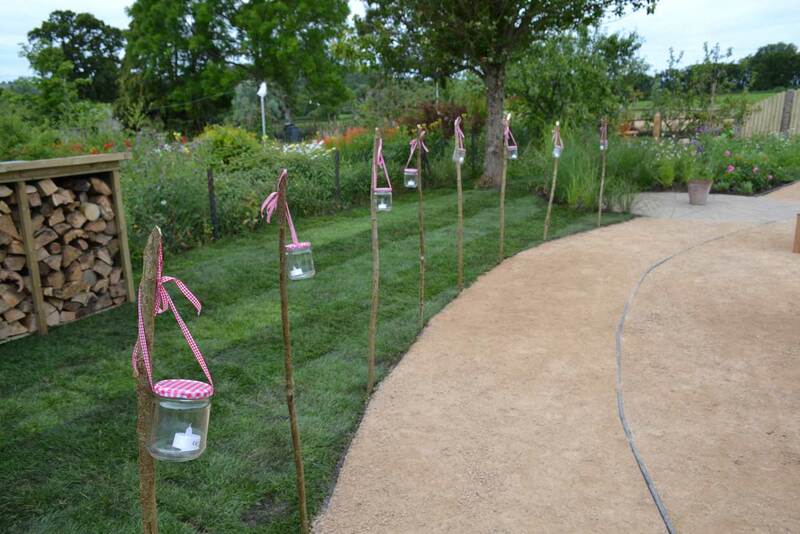 Alan wanted to create a special area in the garden for friends and family to hang out with Rachel and Andrew. 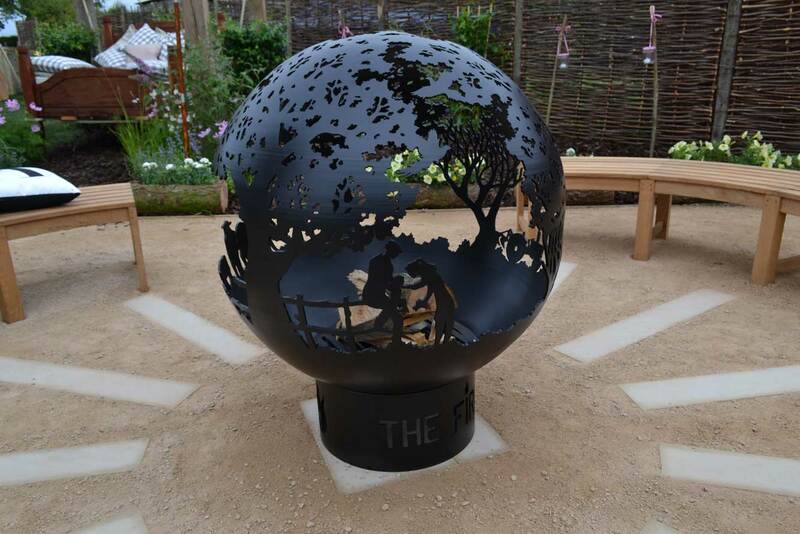 We got in touch with The Firepit Company who create beautiful, sculptured Fireballs, which are spherical firepits. They work great as Patio Heaters for warming up those chilly evenings or just fantastic garden sculpture, especially when illuminated with electric lights. They created a bespoke Fireball for Andrew and Rachel featuring images of the three of them, plus a tractor and a cow incorporated into a countryside scene. The Fireball really enhanced the central seating area which Alan created. These Fireballs turn your outside space in a unique, beautiful and practical way, other uses include unique driveway markers or when incorporating a corporate logo they become great talking points around business premises. They can design and make a Fireball to your specification or you can even hire one for an event! Alan needed some stylish curved seating for his entertaining area with the Fireball. The beautiful, teak, curved, backless benches were just perfect. 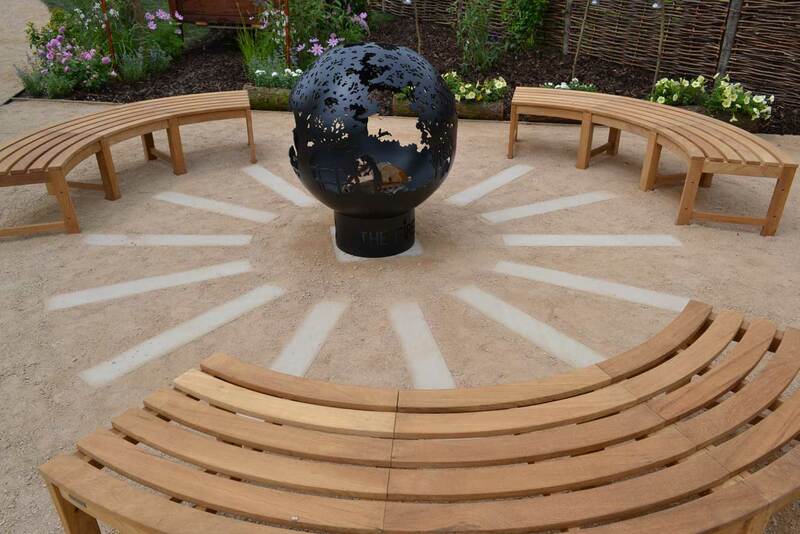 The design of the backless bench is captivating to the eye and looks amazing in Andrew and Rachel’s garden. The high quality teak finish gives it more overall impact, particularly with the curved shape. As a standalone bench it fits perfectly with decorative, curved garden walls around the base of trees or with rounded patio tables, etc. However, with multiple benches like we used, you can fit three together to form a circle with gaps or four together to make a perfect circle. You could even create a snaking bench…the possibilities are endless!